Color digital printing is well on the way to being a highly disruptive force, first for labels and more recently in several segments of the much larger packaging industry, writes James Bevan, managing director of Vandagraf. Over the last decade this multi-facetted and complex industry has transformed dramatically, with major advances in inkjet press design and printhead technology, as well as developments in substrate materials and inks formulations. It is Vandagraf’s view that growth of color inkjet digital printing across the label and packaging industries, already seeing double-digit growth, will speed up through to 2023 and beyond. As the demand for mass versioning and customization of labels and packaging continues to grow, color digital printing is becoming an increasingly vital component part of converter’s capabilities. The big volume demand for consumables will soon dwarf demand for very short run prototyping, versioning and the like, especially in terms of demand for consumables (substrate materials and digital inks). Vandagraf has recently completed a major new market report entitled: ‘A Bright Future for Color Inkjet Digital Printing in Global Labels and Packaging Markets’. The focus of report is the fast-growing area of industrial scale high volume production with color inkjet digital printing and presses which will account for the bulk of demand for consumables (substrate materials and inks). The primary digital printing technology that competes with inkjet is clearly electrophotographic. Other emerging competing technologies include Landa’s nanography. In the context of this study the most relevant analogue printing processes are flexo and offset litho (gravure printing is most cost-effective for very long runs, whereas digital is at its best for short runs – so there is relatively little overlap between the two processes). The report covers labels, flexible packaging, folding cartons, corrugated board, direct-to-3D packaging profiles. Readers of L&L may understandably be primarily interested in the label segment of the wider packaging industry. Nonetheless it can be valuable for companies operating in the digital label segment to be aware of developments across the wider packaging industry, with some interesting insights for label converters. 1. Potential risk of substitution of labels by direct inkjet printing – plastic bottles. Inkjet print direct to 3D cylindrical packaging profiles can be used with a range pack formats and materials, such as plastic bottles, metal cans, glass bottles, tubes, small diameter closures. So inkjet print direct-to-3D technology has potential to replace labels (self-adhesive/wet-glue) for certain pack formats and materials – for example blow-molded PET bottles for carbonated soft drinks, mineral water and beer. A number of companies have already developed inkjet print direct-to-3D technology systems along these lines. It will be interesting to see how the situation plays out in the coming years. In addition to savings arising from the potential eliminations of self-adhesive/wet-glue label constructions, there will be additional savings in shipping and warehouse logistics costs. At present, such substitution is most relevant for short run promotions and the like, due to the still high cost of digital consumables (substrates and inks). As the cost of consumables gets driven down in the future then the threat to label markets could increase. 2. Leading inkjet press manufacturer EFI has moved focus away from labels. EFI Jetrion printing systems have been a leading force in establishing the market for industrial scale digital inkjet label production. Indeed the company has the largest installed base of UV inkjet label presses, with over 500 installed worldwide. 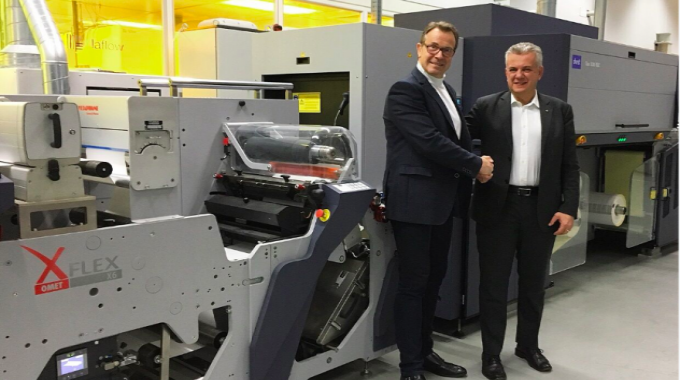 Then EFI decided to exit the label press market, stating that the company was looking to focus on other high growth opportunities and handed over responsibility for the support and supply of its Jetrion digital inkjet presses to Xeikon. Xeikon now services, supports and supplies the worldwide Jetrion customer base, and also continues to promote direct sales of Jetrion label presses as part of the Xeikon portfolio. In recent years the inkjet label press market has become increasingly crowded with numerous new entrants. Such intensifying competition is inevitably pushing down profitability and may well lead to a digital label press industry shake-out in the next few years. Meanwhile EFI has recently launched their new Nozomi C18000 single-pass corrugated board LED inkjet press. The direction taken by EFI makes sense as the corrugated packaging inkjet digital print segment is seeing strong growth at this time. Corrugated packaging is increasingly being used as a promotional tool. Traditionally corrugated packaging was usually printed in a minimal way, with logistics codes and any mandatory text required. Today there is a strong trend to using the superior color graphics and individual pack customization possibilities that are available with inkjet printing. This affects both primary and secondary corrugated packaging for brand products. Over 75 percent of e-commerce packaging by value is made from corrugated board today and this has created a surge in demand for this material. The value of packaging demand in the e-commerce channel is forecast to more than double by 2023. Within this market segment there is a strong demand for customized print of the kind that can be provided by digital printing. Although corrugated makes up a major proportion of this market by value there are also significant opportunities for labels here. Although continuing growth potential for digital label presses may be seen as less dramatic than demand for corrugated inkjet presses, the digital label press market has by no means fully matured. Within the inkjet label press market there are clearly still some very interesting opportunities, such as: standalone entry-level presses for late-stage label printing; higher speed/capacity inkjet label presses – demand will increase as costs of consumables falls in the coming years; hybrid label presses (standalone/retrofit); and Asia-Pacific markets that have yet to widely adopt inkjet label printing. Another driver is the wide variety of relatively ‘small size’ packaging blanks that can potentially be printed on narrow web label presses, provided that that substrate handling transport system can handle the alternative substrates that may be required. The printheads must also be able to sustainably dispense satisfactorily the digital ink specified, which may be different form digital inks used for labels. Over 50 inkjet press builders are profiled in the report. Many of these companies offer a range of inkjet presses with capabilities that span labels through to various kinds of packaging format. Historically digital printing press technology was developed for large scale markets (for example desktop office printers). It has only been more recently that such digital technology has started to be adapted to the label (and also more recently the packaging) converter sector. A number of these leading companies have entered the label and packaging sector leveraging on digital inkjet technology that was originally developed for other types of application. Successful wider roll-out of industrial scale color inkjet digital printing in global label and packaging markets depends upon pro-active collaborations and partnerships between players possessing complementary expertise, resources and skill-sets. Strong partnerships with well-matched synergies with complementary technologies and expertise are proving to be a key success factor in the development of inkjet digital printing, particularly for industrial scale high volume color inkjet. Such synergies and partnerships may be seen increasingly across the industry. To design and build high speed color inkjet presses requires joint efforts between inkjet (printhead) technology specialists and substrate transport specialists (eg analogue label press builders). To create complete systems with the capability to deliver cost effective finished color inkjet printed packaging and labels requires close working relationships to develop digital consumables with more ‘substrate latitude’ working towards industry standard that will work better across a wider range of combinations of Inkjet technologies, digital inks and digital substrates. There are already a number of initiatives and partnerships between various combinations of solutions providers with complementary skill sets and areas of expertise. Even closer collaboration between the respective players in the industry is to be welcomed. All this is being further stimulated by a number of helpful trends in consumer labels and packaging with growth in demand for shorter print runs/targeted marketing; limited duration promotional campaigns as well as multi-seasonal and region-specific demand promotions; smaller-sized packs; internet access via labels/ packaging with smart phones; full color printing for packaging/ labels; premium packaging; and product security. These growth trends are being driven largely by brand owners as they strive to gain advantage in increasingly competitive market environments in which they operate. There is much debate about the cost effectiveness of digital printing for labels and packaging, but in Vandagraf’s view, judging digital printing versus analogue processes on cost alone can be to misread the true dynamics of the industry. This is because digital printing can offer an array of benefits that bring added value that can resonate with the demands of packaging of branded products today. Such benefits are generally not viable with analogue printing processes. So the cost mode and calculation of real overall comparative cost of inkjet production is fundamentally different from that of analogue print, and this must be taken in to account to get a true picture. The inherent capability of color digital printing to achieve ‘mass customization’ and hence ‘unique identifiers’ for individual packs (covertly or overtly) is becoming a highly valued feature today. The range of functionalities that may be achieved based on ‘unique IDs’ on NFC/RFID chips can also be accomplished to a significant extent by means of digital printing of ‘unique IDs’ which can be read optically. While the overall performance and user friendliness of NFC may be seen to be superior, the unit cost of color digital print is much lower. These factors have the strong potential to enhance the ROI case and weigh the argument more heavily in favor of color inkjet digital printing, despite potential cost penalties with respect to longer print runs (compared to analogue printing). Each individual functionality can add value to the overall packaging solution and contribute to an ROI calculation. Multiple functionalities can further improve ROI. It is the Vandagraf view that more emphasis should be focused on the ‘value added’ potential of digital printing for labels and packaging, rather than too much weight being placed on real or imagined cost factors. Somehow getting the message through to the brand owners is key. Cost is closely related to run length and is quite different for traditional analogue processes (eg: flexo), which requires substantial set-up work which is a fixed cost regardless of run length. Whereas digital printing is software driven and does not require set-up work/cost. But color digital inks tend to be costlier and substrate materials can also be an issue. Nonetheless, inkjet offers more affordability than flexo presses for shorter print runs. While hybrid inkjet/flexo printing falls somewhere between the other two processes. Much is made of the high cost of extended print runs due primarily to high cost of digital consumables. But the other big advantages of digital printing should be factored into calculations of viability and overall cost effectiveness as compared to analogue printing. Digital printing opens the door to major rethinks of existing supply chains from raw materials through to finished goods with just-in-time manufacturing, late stage printing, and delivery of variable (whether customized or personalized) designs. So when switching from analogue printing to digital printing, one or more of the following benefits can arise, often leading to an enhanced ROI calculation: reducing complexity; lowering overall cost; reduce transportation costs; reduces inventory levels (raw materials, work-in-progress, finished packaging blanks); eliminating waste and obsolescence. Unlike for analogue printing where the printing operations are almost always located at the converters plant, digital printing opens up more options. Digital presses may be installed at a third party printer/converter (multiple customers/longer runs); a contract packer (intermediate step – multiple customers/short runs); or a brand owner’s plant adjacent to or even linked in-line to downstream packaging/filling operations (a single, big customer – eg: Coca-Cola). In general, the bigger scale high output presses should be located at a converter’s plant services multiple customers. While smaller capacity (including entry level) digital presses can be ideal for brand owners and also contract packers. Contract packers may utilize a range of types of equipment in order to achieve the desired outcome, including product packaging, and filling with product and closing/sealing. With regard to printing requirements, contract packers have traditionally tended to outsource print of packaging that required printing with an analogue process. Digital print changes the dynamic dramatically: in-house digital printing by contract packers becomes a far more viable proposition. The significant capital investment requirement for an inkjet digital press is certainly a factor, although some of the larger contract packer organizations have substantial multi-site operations. The contract packer sector has been identified as a potentially interesting market for color inkjet digital presses. Contract packers tend to specialize in small custom jobs that are more difficult for the less flexible big brand owners to do in house, and small custom jobs business can resonate with digital printing. Contract packers are key players in complex supply chains associated with branded products across international markets. Packaging configurations applicable to contract packing operations include blister packs (card backed) or clamshell blisters, skin packaging; blister packs (aluminum lidding); sleeves (shrink/stretch); stand-up pouches; collapsible tubes; sealed food trays; and cartons. The contract packer industry serves numerous vertical markets, including pharmaceuticals, medical, beauty and cosmetics, nutritional, food, beverages, tobacco and tobacco substitute products, oral health, industrial products, and private label products. Late-stage printing is a key benefit enabled by digital printing. Cost effective late-stage printing works best for relatively short print runs in view of current consumables cost levels. And this points towards relatively low speed/capacity entry level inkjet presses. As consumables price levels are driven down in the coming years, so higher speed/capacity inkjet presses will tend to find more late stage applications involving greater volumes and longer print runs. Inkjet press builders that can offer a range of presses with the option to ‘trade-up’ as demand for late-stage digital labels/ packaging grows can achieve competitive advantage. Moving closer to final packaging operations can be achieved in steps. This can ultimately lead to desirable true print-on-demand (POD). For such an arrangement the inkjet press serves a single customer and is installed adjacent to the carton erection/filling/ closing operations. POD is a printing procedure in which labels or packaging blanks are not printed until a corresponding order is received. As a result the cost of printing can be much better controlled, reducing risk of inventory obsolescence. POD is ideal for short run production. Late-stage print customization can be an effective means of dealing with the increasingly strict labeling requirements that characterize the pharmaceutical and other industries today. Analogue printing processes, on the other hand, traditionally involved concentrating printing operations at a single specialist converter location staffed by specialist print technicians with expertise to operate and maintain complex analogue presses, skilled at set-up preparations required and serving multiple customers. Analogue printing processes are not readily adaptable for such late-stage printing. Inkjet printing of labels (and more recently packaging) has been growing consistently over the last decade. Today, production color inkjet digital label printing has become a mainstream largely reel-to-reel based market, with cut-sheet demand for consumables now accounting for a relatively small proportion of overall demand. A persistent limiting factor has been sub-optimal and high cost substrate material/inks combinations that continue to the present. A key area of development required for color inkjet digital in labels and packaging is to achieve better matching between inkjet technology – eg: printhead technologies (there are several distinct production inkjet systems available commercially, each tending to have different characteristics, which inevitably adds to the overall complexity of the problem), substrate materials, and digital inks. Ideally standard consumables that perform satisfactorily with several (even if not all) of these different systems would be desirable. Consumables producers would then be better economies of scale in production. Digital inks and their interaction with substrate materials is also a critical element here. An ink essentially consists of pigment suspended in a carrier liquid. The inks must be delivered to the surface of the substrate material and bond to it effectively. The range of substrate materials with which an ink is compatible determines what applications the press (digital or otherwise) will cope with. The type of ink carrier used is central to substrate material selection and compatibility. Indeed it is not uncommon for digital inks to be specially formulated for a specific digital press/printhead configuration, or the actual substrate material to be printed. Amongst the challenges facing providers of digital substrate makers include the need for lower total costs for inkjet treated substrates, and the need for new technology for coated substrates. Substrate materials that require pre-print or post-print coatings to facilitate digital printing drive up costs. Clearly tension can arise between the current expediency of multiple custom substrate materials aimed at achieving optimal performance for different applications and the pressure to develop more cost effective standard solutions that can benefit from economies of scale with high volume production. The situation for substrate materials providers becomes yet more challenging in the face of hybrid digital/analogue presses (which continue to see robust growth in 2018) – whereby substrate materials need to support both color inkjet digital and analogue (eg: flexo, offset) printing on the same print surface. To a significant extent digital printing will continue to be complement analogue processes, as witnessed by the rapid growth of hybrid inkjet/analogue presses in the label segment. It appears unlikely that any one incumbent analogue printing technology will be completely displaced by new developing technologies. And furthermore ancillary functions, such as finishing and substrate materials, also need to be taken in to consideration in relation to suitability of substrate materials for a particular application. The respective groups of solution providers need to be closely aligned and efforts synchronized in order to advance towards optimal print quality with regard to labels and packaging. Substantial investment in R&D, both independent and collaborative, is ongoing, but there is still a long way to go to achieve competitive price levels for digital consumables for higher volumes. But there are reasons to be optimistic in this regard. The great potential rewards will be matched by levels of investment in R&D needed to reach the goal. The industry has the resources, both financial and technological. But the devil, as always, will be in the detail. There will be winners and losers in this great enterprise. The characteristics and specifications required for digital inks used across the various labels and packaging segments digital printing sectors tend to be significantly different. The common factor is that the inks all need to jet and function reliably. Color inkjet digital presses generally use one of two types of inks. UV inkjet presses employ inks that are 100 percent solids and contain pigments, pre-polymers and UV-sensitive materials. Once the ink is printed onto a substrate, the pre-polymer hardens and forms a dry, colored layer under the influence of UV light. The hardened UV ink offers excellent resistance to water and fading and is comparable in chemistry to UV flexo. With UV curing technology the jetted ink droplets are typically cured into a hard and durable, impermeable surface within a fraction of a second. UV inkjet is suitable for narrow web printing on thick material such as labels and direct-to-shape. Water-based inkjet platforms, the second type, use inks with colorants that are dispersed or dissolved in water. During printing, the substrate absorbs the water, with the dyes or pigments remaining on the substrate. The speed of adoption of aqueous ink technologies in some sectors have been somewhat slower than anticipated, but with more recent gains in ink functionality, combined with print head and printing press capabilities, this ink technology is gaining momentum now. Water-based inkjet is appropriate for single pass large width printing for flexible packaging and paper and board applications. Water based digital inks can be suitable for food safe packaging. Solvent inks provide desired durable printing results but are not commonly used for label applications because of their high environmental impact. UV-cured inks are increasingly replacing solvent ink despite being generally higher cost.